Italian engineer, designer and architect Massimo Moretti has studied the way a wasp builds its home using many thin layers bonded together. He has taken what he has learned and created a process that builds structures using a 3D printer and specially prepared mud. He even calls the organization he created the World’s Advanced Saving Project, or “WASP”, for short. He says it is dedicated to making new housing more affordable, particularly in places where the most abundant resource may be the earth itself. 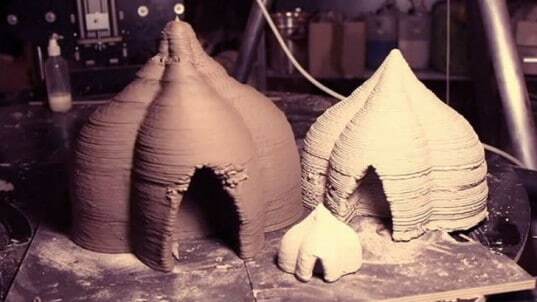 Moretti and his team have been developing their 3D printing system for the past two years and hope to work their way up to a full scale, 20 foot tall, portable 3 armed printer that can be trucked to wherever it is needed to make a full size earth and mud house. Once the local earth is powdered, it is mixed with water and fed into the machine, which builds the walls layer by layer just like a wasp does in nature. 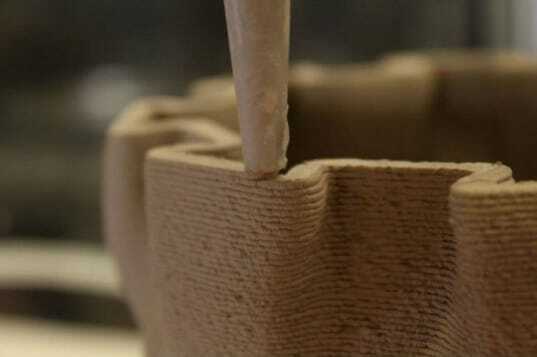 Because the printer is computer controlled, the shape of the finished 3d printed house can be anything the designer or resident wishes it to be. The finished structure is very strong and is, or course, about as eco-friendly as a building can be, being make mostly from the very earth it sits on.